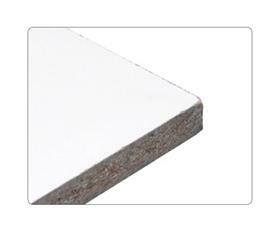 White thermal fused melamine provides a smooth surface that resists moisture and scratching. Attractive 3/4" board fits neatly into step of beam so that the top of the board is flush with the top of the beam. Shelf Supports (sold separately) are used in conjunction with particle board to add support and provide for high shelf capacity. FOB Shipping Point.